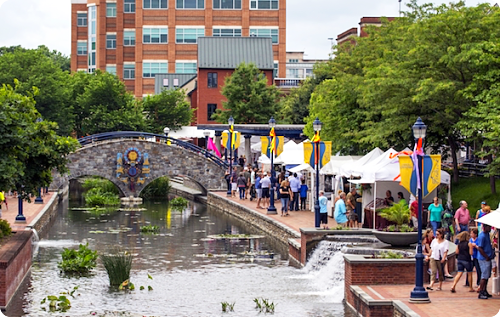 This year marks the 26th anniversary of the Frederick Festival of the Arts, held the first weekend in June on the Carroll Creek Park (an urban park) in the heart of historic downtown Frederick which is less than an hour from DC and Baltimore. This Festival is a juried event of 100+ diverse artists who are chosen by a panel of three independent jurors. The Frederick Festival of the Arts has strong community support and is well attended by locals and visitors alike. Under new management by an experienced art show organizer, this year's event will continue to be well organized, with adjustments made to accommodate artist feedback. A strong advertising campaign will support the high-quality exhibitors and arts programming. Artists are well taken care of by helpful staff and volunteers, and while load in/out is carefully organized, there is plenty of help to assist. Other amenities include 24/7 security, nearby convenient parking, booth sitters, complimentary lunch and complimentary awards breakfast on Sunday morning.